Ryan Nolan is not a young man easily fazed. The 19-year-old speaks three languages. He's lived in Ireland, Spain and now Italy, and is honing his craft as a defender at one of the biggest clubs on the planet: Inter Milan. Nolan spent the first eight years of his life in Shannon, Co Clare, joining local side Park Rangers as a five-year-old and showing early promise. His family holidayed in Murcia every summer, eventually taking the plunge and starting a new life in the town of Torre Pacheco, which lies within the Spanish region. Given that he was so young, the transition came quite easy to Nolan. The universal language of football helped him bed in quickly. "It took a few months to learn Spanish; once I had the language it was easy enough," Nolan tells RTÉ Sport, his Clare brogue still strong. "I played football straight away." He turned heads quickly too. Nolan was selected for the provincial representative Murcia team, and got to test himself against some of the best players in his age group in the country. Though several Segunda Division sides hovered, Villarreal looked his most likely destination. He had trials with the Yellow Submarine and was waiting on them to make their move. Then, fate intervened. Pierluigi Casiraghi - the veteran scout who passed away aged 76 two weeks ago and brought the likes of Mario Balotelli and Philippe Coutinho to the San Siro - saw Nolan play in a tournament and acted swiftly. Roberto Mancini was then at the helm at Inter and Casiraghi saw, in the Irish teenager, qualities that could be honed at the Italian giants' renowned academy. Casiraghi had known Liam Brady when the Dubliner graced the San Siro during the mid-80s and was quick to remind Nolan he would be following in the footsteps of one of the Emerald Isle's great players. Nolan jumped at the chance to make the move, agreeing to go even before he'd spoken to his parents. Aged 16, he headed for Milan. "At the start it was difficult," he admits. "The intensity was way higher. I was fluent in Italian after about four months because it's so similar to Spanish. I picked it up very easily. I learned more just being around the lads in training than in school. "Shannon is a small town, and in Murcia it was a bigger town but it's not a city. When I moved to Milan I had to get the metro every day. It was a big difference, but I liked it." His day is structured and routine. School lasts until midday, after which a bus picks up the players and brings them to lunch. Another bus drops them to training with sessions lasting until about 5pm. The bus arrives again, dinner is served at 7.30pm, and then it's home to rest. That's five days a week, the training structure being tweaked depending on what days games fall. Sometimes the focus is on physical fitness, conditioning and strength. Other sessions concentrate on shape, positioning, technique. It has suited Nolan well. He's strong and brave, tall and wiry - versatile too, capable of playing anywhere along the back line. Progress has been steady. He's tasted UEFA Youth League action against Dynamo Kiev and Spartak Moscow. He helped break Roma hearts in an extra-time U19 Supercoppa final triumph back in January and was also part of the team who lifted the highly prestigious Vareggio Cup ten days ago, defeating Fiorentina 2-1 in the decider. "In Spain training was mostly about little possession games and rondos (typically 6 v 3 matches in tight areas where players are only allowed one or two touches of the ball). "Here there's a lot more work without the ball, more tactical work and shape. Especially for defenders. "In Italy they look a lot more at your body position and awareness. I get back (to Ireland) once a year, in the summer for a week or ten days. "When I have a weekend off I usually go to Spain to see my parents and my brother. Spain is kind of home." But Ireland will always be the motherland. He's played up to U18 level and wants more appearances in green. Right now though the target is to make the final step up to the seniors at Inter. Nolan knows how difficult the last leg of his journey will be. 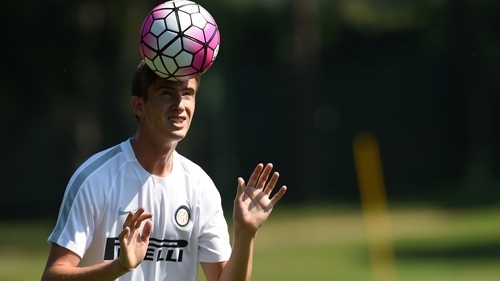 Stefano Vecchi, head coach of the U19s, describes him as "a centre-half with good physical attributes. "He's good in the air and his determination is certainly his main strength. He stays very switched on and he's determined and aggressive. He's made real progress because he's so keen to improve." It's incredibly difficult for any young player to break into such an enormous club. Nolan may have to continue his progress elsewhere, on loan at a team in Serie B or C.
It's standard for the likes of Inter to farm promising talent out so they can play against men, and learn in the school of hard knocks. "It's a big step," adds Nolan when sizing up his chances of breaking into the first team. "But I dream at night about playing at the San Siro. And hopefully one day I can." Ryan Patrick Nolan. Remember the name.